Blue Texels are not the most numerous sheep in the UK but one Scottish couple, whose passion for them has helped promote and develop the breed, is David and Jennifer Alexander. Erika Hay visits Ayrshire to meet them. Breeds come and go with fashion, while a few stick around to become the mainstay of the British sheep flock. 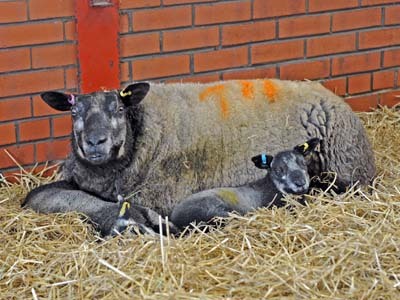 But husband and wife team David and Jennifer Alexander believe the Blue Texel, with its conformation and ease of lambing, will be here to stay. The first Blue Texels were introduced into the UK in the 1980s from Holland at which time the Alexanders were involved in Rouge de l'Ouest sheep. As the market gradually disappeared for Rouges, David started looking for a suitable terminal sire to cross with his Rouge cross Lleyn ewes and was impressed with the carcase quality and skin of the Blue Texel. At the time of purchasing the first two ewes and a ram in 1998, David and Jennifer did not take the wool into consideration. 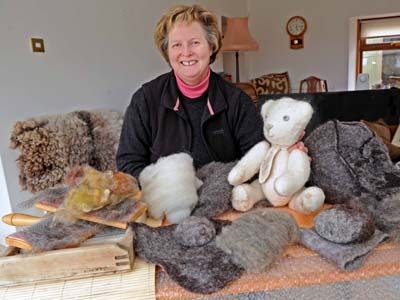 But the fine quality, dense wool which has shades from steely blue through to dark brown and silvery grey, has proven to be a bonus for Jennifer's felt craft and now she has promoted an awareness for these fleeces for spinners, weavers and those into crafts. 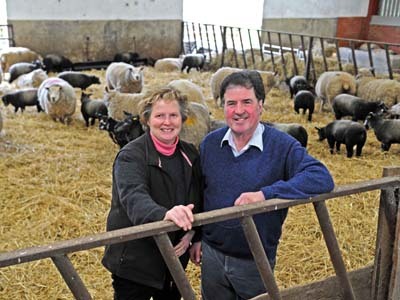 The farming enterprise all started in the early 1980s when David, who had a veterinary practice in nearby Mauchline, bought a 1.6-hectare (four-acre) smallholding and put a few sheep on it. The pair jumped at the chance to buy the 40ha (100-acre) Millside Farm in 1987 and in 2000 added a further 35ha (85 acres) bought from a neighbour. David retired in 2005 when he was still young enough to enjoy a good lifestyle and decided to concentrate on his sheep. By this time numbers had reached about 400 breeding ewes plus about 100 bought-in ewe lambs which were sold as gimmers. The main breed was Lleyns which were mostly bred pure, but some were crossed with firstly the Rouge and then the Blue Texel. Other enterprises on the farm are bed and breakfast cattle which are wintered in the new slatted sheds David built and grazed along with the sheep in the summer. He also makes his own silage to feed these cattle and haylage for the ewes which are all lambed inside. Nowadays, ewe numbers total about 200 with Lleyn gimmers, ram lambs and shearlings sold at Carlisle and Skipton. The benefits of the Lleyn breed are well-documented and David is not surprised popularity has increased so much over the years with the breed's prolificacy and easy-care attributes. 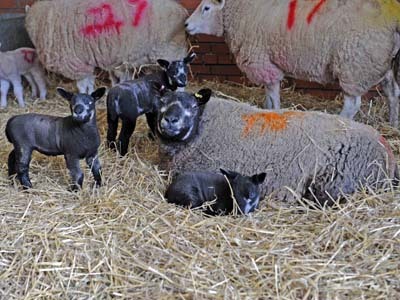 He continues to breed the best ewes pure while the tail-end are crossed with Blue Texels and the progeny used as recipient mothers for his embryo transplant programme. These ewes are the first to lamb in mid-January with some ram and ewe lambs, as well as shearlings and gimmers destined for pedigree sales later in the year at Carlisle , Builth Wells and Skipton, with some being sold privately. The Millside flock is one of the biggest and oldest in the relatively new Blue Texel UK flock book and has been incredibly influential in the breed. A glance through breed sale catalogues and the Millside prefix crops up in many pedigrees, making it difficult for David to source replacement tups for his own flock. He was lucky enough to buy Craigalbert in 2006 from Ian Campbell at Ballantrae, a tup which has arguably been the most influential on the breed in the UK . The following year, David bought Jonsland Dan, a lamb bred by Dan and Janine Jones, Powys, which was champion at the Royal Welsh Show. These two tups have been used extensively on the Millside flock and most of the ewes now carry their bloodlines, so David is on the lookout for replacements. He says: “Our bloodlines are spread throughout the UK flock now, so I may have to go to back to Holland to find suitable tups. Conformation and skin are the most important traits but they must also have style and proper facial markings. Sons of Craigalbert have sold for up to 1,800gns to Andrew Frogatt, while the tup also sired the breed's joint top-priced female, a gimmer sold at the Millside production sale in 2011 for 2,600gns to Dan and Janine Jones. A ewe lamb by him sold for 2,000gns to John and Emma Lyle, Fife, while another of his daughters was sold to Norwich breeders, Hayley and Andrew Clarke, who went on to take the championship with her at the East of England Show in 2012. Jonsland Dan's progeny have also been to the fore – he was the sire of the Royal Welsh Show Champion 2010. 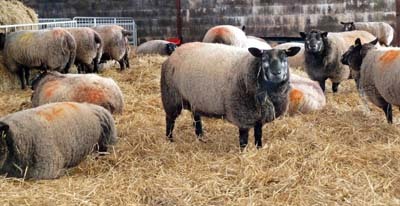 All sheep are MV accredited which means there is a ready market among pedigree breeders even for cross females, which can be incorporated into an accredited flock as recipient dams. Unfortunately, despite enquires, export markets are closed to the Millside flock as it does not qualify for membership of the scrapie monitoring scheme because of annual purchases of Lleyn ewe lambs to supplement the consignment of gimmers sold each year. Cross wether lambs and any Lleyn wethers are finished and sold at local markets at about 40-45kg liveweight and most of the Blue Texel lambs are bought for local butchers as they kill out well with top grades. David and Jennifer have tirelessly promoted the breed in Scotland , taking stands of their own at some sheep events such as Highland Sheep, Dingwall. This resulted in sales to Orkney, Shetland, Caithness and Stornoway. Two years ago when Scotsheep was just along the road at Dumfries House, all the sheep on the Blue Texel Society stand belonged to David, however it was Jennifer's display of feltwork which proved more of a magnet for Prince Charles. 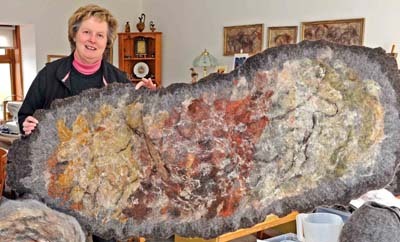 Lleyn and Blue Texel wool was used by Jennifer and her colleagues to demonstrate, while her spectacular cave painting-style feltwork wall hangings were on display, including the one which had previously won a Highland Show championship. As well as these was a huge variety of finished articles were on show portraying a wide perspective of handspinning, dyeing and feltmaking skills. It was Jennifer's privilege to introduce Prince Charles to all involved and talk him through the processes. As a result of her demonstrations in the NSA tent at the Highland Show, Jennifer has had several commissions for felt wall hangings. She also carries out workshops during summer, teaching people how to make felt using new season's wool. The most sought-after wool comes from hoggs being clipped for the first time and Jennifer has started retaining these special fleeces for craft-workers throughout the UK . A shearling ewe fleece can weigh 4-5kg, which can command a good premium, especially if it has been well skirted and has a good variety of colours in it. David and Jennifer believe it is not only in the wool market the Blue Texel breed is making an impact.